Destination Knowlton >: Knowlton en Lumiere: A bright idea! The newest Festival in Knowlton is the winter spectacular organized by the local Chamber of Commerce with the support and cooperation of the Town of Brome Lake and the brave volunteer fire fighters. It makes sense for our beautiful village to have another festival...we love throwing a party! 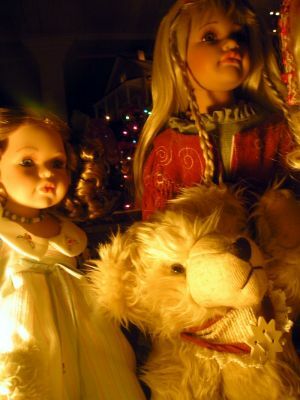 Getting into the spirit of Christmas is a proud tradition in Lac Brome and most homeowners and independant businesses are anxious to un-veil our Christmas displays and decorations. With the infectious spirit of the region during the holiday season Lac Brome is likely to be the brightest place in the Eastern Townships! The Knowlton Festival of Lights will be the new "official" name of the traditional annual lighting of Christmas lights in central Knowlton's downtown's trees and along the three main entry routes into the village of Lac Brome. While bright lights and traditional Victorian decorations in the village are not new; this year marks a concerted effort by the Chamber of Commerce and enthusiastic volunteers to get everyone involved with the infectious spirit of the Winter season. In addition, and for the first time, the Knowlton Festival of Lights will decorate one of Quebec's Eastern Townships landmarks, namely our St. Andrews United Church. Lights will also light up Knowlton's falls in the central Coldbrook Park and is sure to provide a spectacular winter scene as the lights will reflect off the fluffy snow in the trees and off the glistening ice on the pond. The miniature railway and doll houses in central Knowlton are a must-see centrally located attraction. 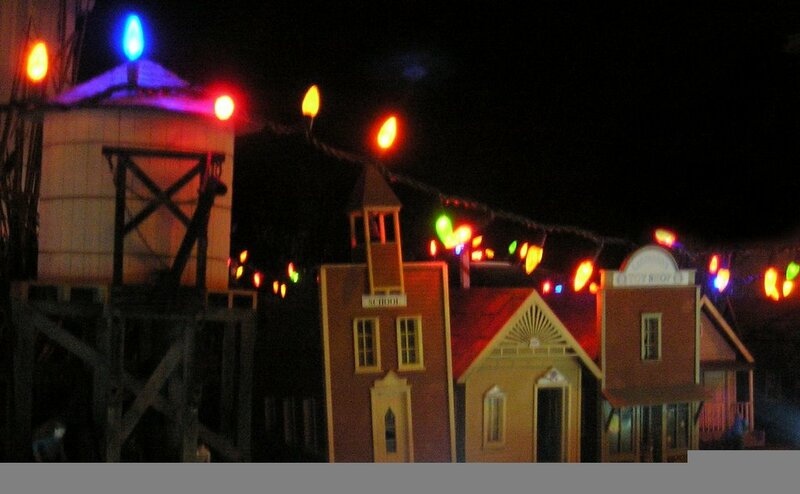 Trains roll along the tracks in a brightly lit miniature village. Both young and old love to stop and follow the locomotive and imagine adventure stories about the tiny residents of the lilliputian village. A skating rink in the park will surely be popular, especially on milder days, so make sure to bring your skates! Since most of Knowltons restaurants, coffee shops, and bakeries are right in the center of the village it is sure to be full of warmly dressed families enjoying the hospitality. An evening in Knowlton will surely be a glittering and romantic affair and don't forget that the proximity to such winter attractions as skiing in Bromont, Owl's Head and Mount Sutton will make it a perfect winter vacation in Quebec. Residents have surely noticed the activities in the downtown area as teams of volunteers with stepladders and, recently, cranes were seen hanging lights on the church steeple. During November, even while warm temperatures kept us all from worrying about making the appointment for changing to snow tires, Gerry Moar of the Knowlton Marina and his entourage of volunteers were busy assuring that the lights were placed with care! 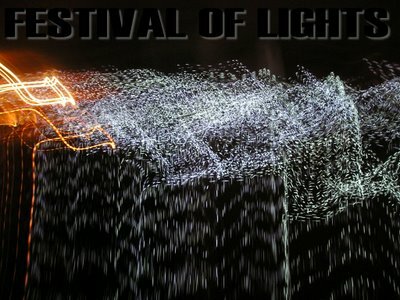 Read more about the setup of the lights by the Light Brigade. 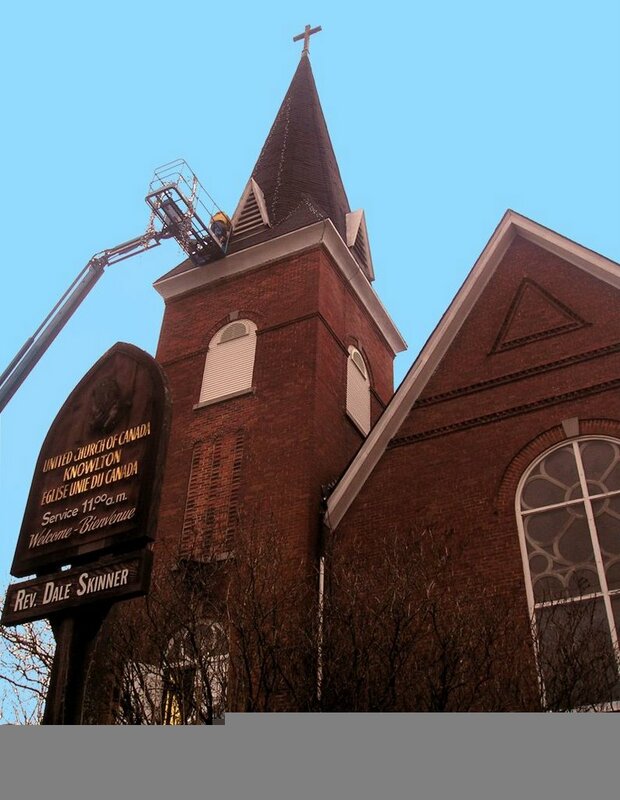 A large crane was required, and a brave soul with the courage to ride to the dizzying heights, to get the lights fixed to the steeple of Knowltons most well recognized monument the Saint Andrews Church in the center of the village. The lights on the tall steeple are surely to be an angelic and magnificent sight! The official flipping of the switch has been set for Saturday December 2nd after the Knowlton Santa Clause Parade at which time Lac Brome will officially launch the first annual Festival en Lumiere. With the enthusiasm that Knowlton residents and businesses embrace new ideas, and with this latest festival to add to our many local festivals, it's easy to see why the hospitality and charm of our region is attracting more and more people to visit and live here! Following the stringing of the lights throughout the village in mid November by "the Light Brigade" as they were affectionately known same folks wondered about the look of the new, more energy efficient and long lasting LED Christmas Lights: the light from these bulbs is not what many traditionalists are used to and it raised a few eyebrows. 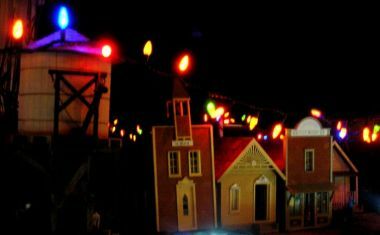 Comments on the esthetics of the lights were mixed: some appreciating the enthusiasm of the town and the sheer distribution of the lights throughout the village and some feeling these new blueish LED lights were too dim and cold to even be called Christmas Lights. Of course when society made the leap from wax candles to filament filled glass bulbs there were probably a few critics who decried the innovation as an abomination so it should be noted that while the new fangled light bulbs might not be everyone's cup of tea but let's face it: it's the thought that counts! One person wrote to DK (DestinationKnowlton.com) about the new style of lights: "These lights may be longer lasting and consume less electricity but they don't have any warmth, they look like some sort of interior lighting component ripped out of a Texas Instrument calculator display screen tied to the branches! Just looking at them makes me physically feel nauseous!" wrote the resident, who was obviously in a Scrooge-ish disposition. Seemingly unable to understand the desire of the town to want to make a purchase (the lights) that would last more than one season, she continued in her letter, "The reason why I think these LED Christmas lights are ugly is that they do not really seem to "shine" any light but only emit a slight glow...when you look at a string of them hung in a tree it shines no light on the branches of the tree or on any surface for that matter so the effect is not one of enlightening but more like a strange glowing line drawn in the sky. They aren't even white but have a cold an almost alien blue color! They don't say "have a very Merry Christmas" they say "on sale at Canadian Tire"! It reminds me of the merriment of my car's dashboard or the black lights we used to have in University...and I wonder if I should wear a psychedelic glow in the dark shirt to fit into this Christmas in Knowlton!" Well Scrooge, let's see what your decorations look like! We prefer to see people being positive instead of complaining, after all....it's almost Christmas! There are people who offer their time and energy to beautify the town with the limited resources that are available so it should be appreciated…besides…more and more businesses and private home owners will be installing their lights once it starts to feel a bit more like Christmas in the Eastern Townships so the brightness of the town will only increase. While the red, blue green and twinkling white lights of old might be what many of us consider to be traditional lights for the season such comments are a bit harsh considering we still don't have any snow and we don't officially start the Festival of Lights until December! There are so many residents and merchants who are preparing to add their lights to the mix and the combination will indeed be spectacular especially if we see some more of the traditional brighter lights to add a new dimension to the Festival. Once our trees are plumped with thick layers of snow, and the lights are shining like hopeful stars, the magic will be inevitable! Along with the twinkling lights is the unique shops and restaurants in Lac Brome. While we may be a small town there is such a collection of passionate and creative people who live here that the merchants of the area often have some incredible and unusual offerings. This window display pictured here is right beside the miniature train display has some absolutely wonderful seasonal knick-knacks and quality vintage gifts. Knowlton, Sutton and many of the small villages nestled in the area offer some truly unique opportunities for visitors and the Festival of Lights is just another good reason to come and visit us and enjoy the warmth of the area. Everyone who worked hard on the first annual Festival of Lights deserves a large bouquet! And to all of you who come to see us during this time we hope you have a very Merry Eastern Townships Christmas!! DK will highlight a collection of photos taken throughout the Festival; visit our photo gallery to see the full documentation of this event. More photos.